and being worse than this one we live in now. She was released from criminal custody immediately after the court date, and NC HEAT members along with YOI staff came to the jail to welcome her home with open arms. We came to the Division of Social Services building and stood behind Selina as she demanded to be housed in Raleigh, where she would be able to finish her studies without the disruption and displacement of having to start over at a new school in a group home environment. By the end of the day, we had won demands one and two from our petition, with Selina released from jail into a family-based placement in Raleigh where she can finish her senior year at Southeast Raleigh high and graduate with her friends! With almost 1,000 signatures on our petition pressuring the Wake County School Board, the Division of Social Services, and Raleigh PD; we are on track to win all nine of our demands. We who believe in freedom cannot rest until we have mechanisms for oversight and accountability from SRO’s and discipline policy that is transformative, and not punitive in our schools. We believe that we will win! 1. We call for the Immediate Release of Selina Garcia! Selina Garcia is a 17-year old North Carolina high school student and activist who has been held in an adult correctional facility for an alleged altercation on a school bus, a non-felony offense, since March 7, 2014. 2. We demand that the North Carolina Division of Social Services (NCDSS) immediately sign Selina out of adult jail and place her in an appropriate foster care home setting in Raleigh, NC in order to allow Selina, who is currently a senior, to graduate in June 2014 and remain eligible for college scholarships. We demand this happens as expediently as possible, and that if she is put in a temporary placement, that she be in a home where she is loved and welcomed, and not a jail. We demand that housing offered by community members in Raleigh be considered as temporary placements, even if the family offering that housing is not yet foster care certified. Jails are not legitimate homes for youth! 3. We call for a full independent investigation of the collusion between Mr. David Schwenker, Southeast Raleigh High Principal, and the Raleigh Police Department that allowed for the overturning of a low level suspension for Level 2 offense on a school bus. 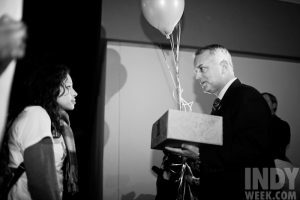 We demand an answer of why a minor school-related dispute between two students resulted in Selina being arrested, charged with three misdemeanor offenses and imprisoned in an adult correctional facility. We are especially concerned that Mr. David Schwenker or any educator would allow young people in their academic care to be subjected to such extreme abuse and trauma. 4. We call for a full independent investigation of the foster care workers and supervisors employed by North Carolina Division of Social Services (NCDSS), who allowed Selina Garcia and countless other young people to be held in adult correctional facilities in lieu of foster care home placement. 5. We demand the drafting of a new Memorandum Of Understanding between the North Carolina Public School System and the Raleigh Police Department that ensures community and school control over police activities. Wake County advocates have continued to raise concerns that the Raleigh Police Department can trump the power of educators and administrators on school property. We reference a similar incident last year that made national news at Enloe High School when Raleigh Police brutalized and arrested seven African American students and a parent who attempted to intervene in the aftermath of a senior prank water balloon fight. Then, as now, the school administrators say it’s out of their power. 6. We support the North Carolina RAISE THE AGE Campaign. Young people in NC are legally tried as adults and we must get children out of the adult correctional system. We are outraged that because Selina is 17 years old and legally a minor, she is unable to sign herself out of jail. North Carolina is the only state in the nation that tries 16 and 17-year-olds as adults for misdemeanors and incarcerates them in adult facilities. Currently, Selina is old enough to be tried as an adult and incarcerated with adults, but not old enough to sign herself out, which she could do today if she were 18 years old. We demand an end to this hypocrisy. 7. We demand that Wake County Public School System put a moratorium —or temporary pause— on suspensions and instead implement the NC Coalition for Education Justice’s Restorative Justice proposal. The Wake County School Board is well aware of Wake County’s School-to-Prison Pipeline. Concerned students, parents, community leaders and advocates have filed a federal complaint with the Department of Justice about unjust school discipline policies in Wake County. However, the school board has failed to adequately address these issues. 8. 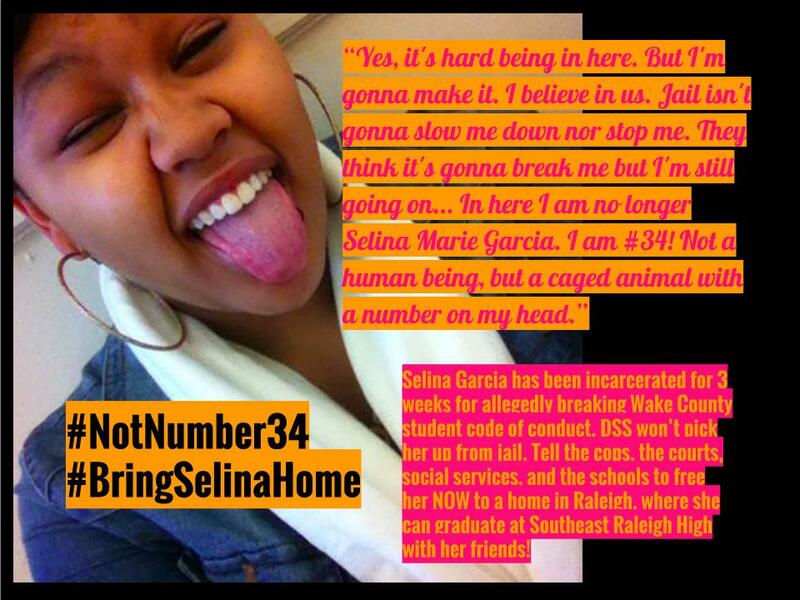 We demand that Selina’s past not be put on trial and that the media not demonize her character. Selina Garcia is a bold activist with the student group NC HEAT. She is a kind and compassionate young person. There is a long history of deflecting systemic injustices onto individuals and misrepresenting their personal histories, and we reject the twisting of Selina’s story and the negative ramifications that could have on her trial. 9. 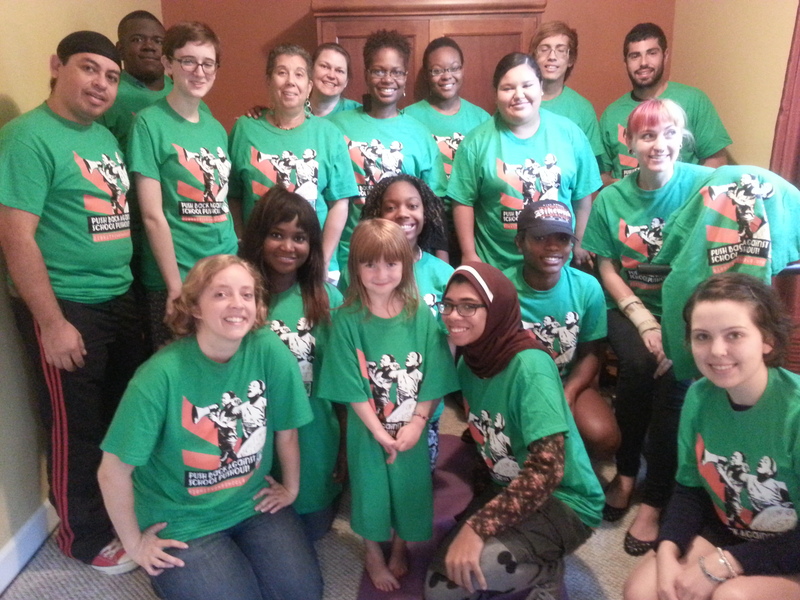 We recognize and stand in solidarity with the ongoing campaigns against the school to prison pipeline! NC HEAT, Dignity in Schools Campaign, Education Justice Alliance and countless groups across North Carolina and the U.S. have been organizing to replace punitive discipline practices with more humane restorative justice practices. 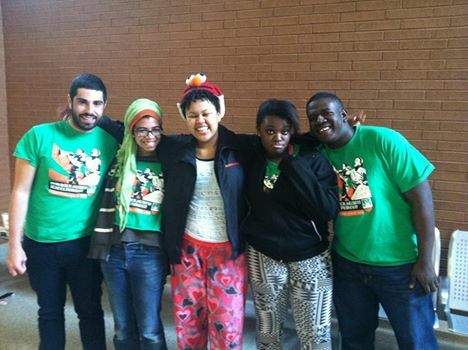 We firmly believe that Students, especially of color belong in School, NOT Jail! Institute mobilized to the Superintendent Forum/listening tour at Southeast Raleigh High School. While we were grateful that Dr. Merrill, the new superintendent of Wake County schools, held the forum we are looking forward to engaging with more meaningful dialogue in the future. 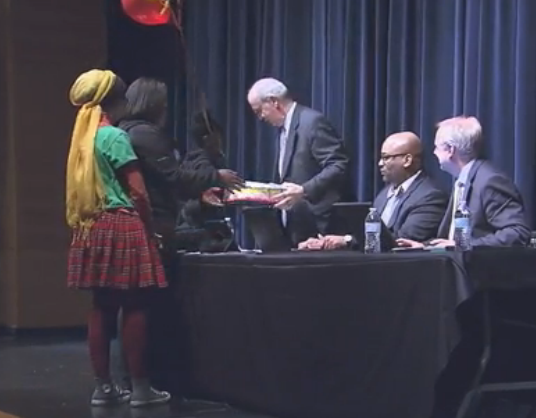 Like in 2011 (pictured right), NC HEAT presented the new superintendent with a cake and balloons as a welcome gift and a challenge (pictured left). 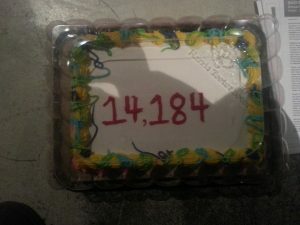 The cake delivered read “14,184” which is the number of suspensions that took place in 2011-2012. While this number has decreased from the over 20,000 suspensions annually Wake County was accustomed to, we still have a long way to go. Other members of NC HEAT and the Education Justice Alliance commented about the excessive policing in schools, the need for more data collection on school based arrest, and called for a change/Moratorium for Out-Of-School-Suspensions policy. The coalition is demanding that Superintendent Dr. Merrill have a meeting with those most impacted by the School-To-Prison-Pipeline and give a timeline for when new discipline policies will be introduced an implemented. While we were disappointed Dr. Merrill would not take a picture with us, we will continue to extend a hand in friendship. Maybe next time he can let us know if he prefers brownies or cupcakes. NC HEAT Solidarity with Teachers! North Carolina Heroes Emerging Among Teens (NC HEAT) recognizes the struggles of North Carolina teachers and students to be intertwined. We recognize that education based on harm reduction and restorative justice are contingent upon meaningful investment in educators and student support staff. As students in North Carolina, we can personally see and feel the impacts that our state’s policies towards teachers are having. Our class sizes are growing, our classroom resources are slowly diminishing, and just as these issues are impacting us as students, they are also hurting the very teachers who are dedicated to helping us get the most out of our educations and succeed. Teachers in North Carolina are significantly underpaid in relation to teacher salaries across the rest of the nation. Having the 4th lowest average teacher salary in the United States, $10,000 less than the national average, North Carolina is losing the valuable teachers that school systems need to successfully educate students. Teachers should not be forced to work separate part-time jobs in order to make ends meet. When talented and dedicated teachers are relocating to other states with higher salaries, students in North Carolina are being put at a disadvantage. From a young age, teachers are a vital influence on the lives of students and when the proper resources are not being provided in the classroom, this influence can become lessened. Especially within younger grades, teacher assistants are particularly critical in the classroom. Students need as much one-on-one attention as they can get, and without these teaching assistant positions, this attention becomes significantly harder to come by. NC HEAT demands that teachers be paid adequately for the work that they do, that class sizes be reduced, and that paid teacher assistants and other support staff be hired. 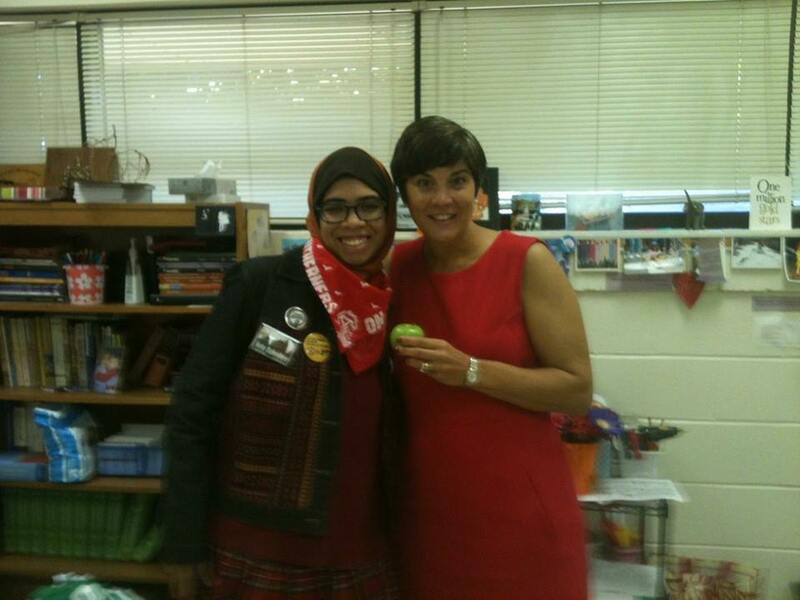 We encourage students across North Carolina to participate in walk-ins across the state in protest of current policies, and give their teachers an apple on November 4th in an act of solidarity. The week will launch a campaign to put a moratorium, a temporary pause, on level one out of school suspensions in Wake County. In the 2011-2012 school year, over 14,000 students in Wake County were suspended from school. Students of color, economically disadvantaged students and students with disabilities were suspended at disproportionately high rates. in Wake County where black students receive over 60% of suspensions but make up less than 25% of the school population. This campaign asks that during the pause administrators and community members study and recommend alternatives to suspensions that implement research-based restorative justice practices. WHERE: The march begins at Washington Elementary School (1000 Fayetteville St, Raleigh, NC ‎27601) and ends at Central Prison (1300 Western Blvd). **Watch this video, created by NC HEAT member Q Wideman about last years march. This September, NC HEAT members attended a series of candidate forums for aspiring Wake County school board members and posed questions around discipline issues and youth voice and engagement in education policy issues. These questions were also emailed to the candidates who had 10 days to respond. Four of the eight candidates went on record, answering the questions the youth posed.